In Lawrenceville, Georgia a couple is saying that a trip to Little Caesars Pizza left their 2-year-old daughter screaming in pain after scalding-hot cheese and sauce fell onto the child’s hand and leg Friday night. The young girl’s mother, Koddi Dunn, of Cornelia, Georgia, told WXIA they were on their way home from visiting with their husband’s mother when they decided to stop at a little Caesars in Lawrenceville that they frequented. According to the Dunns, the restaurant was packed at 8:30 p.m. but they waited and eventually got their pizza. They started eating in the car on the way home, but Dunn said she had no idea that the pizza inside was not the temperature that they were used to. “We had no idea that it was basically lava inside that pizza box,” Dunn stated. When her 15-year-old tried to pass a slice to his 9-year-old brother, Dunn said burning liquid dripped on the 2-year-old Jordyn’s right hand and leg. My daughter (was) screaming like you’ve never heard before,” Dunn stated. The Georgia parents rushed her to a local hospital for treatment, where doctors said she had second-degree-burns. Photos Dunn posted on social media show large blisters on Jordyn’s skin. The Dunns said that they went back to the Little Caesars location and a manager told them the restaurant was so busy that night workers gave them a Hot-N-Ready pizza straight out of the oven. Dunn said that she warned the kids that the pizza was hot after feeling that the box was warm but claims that the cardboard masked the pizza’s true temperature. 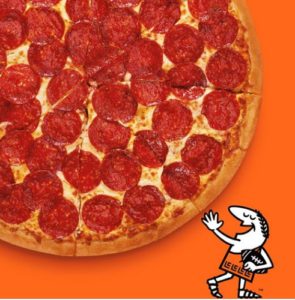 According to a trivia question Little Caesars posted in 2013 on Facebook, the pizzas are cooked at 550 degrees. At the law offices of Jones Brown, we pride ourselves on principles of honesty, hard work, fair dealing and compassion in our representation. Our goal is to let clients focus on healing while we take care of the legal process of recovering from your accident. Our attorneys and staff are committed to adhering to a strict code of professional ethics. We dedicate ourselves to our clients’ best interests and making the legal process as painless and simple as possible for the injured and their family. Our mission is to make accessible legal help and services for everyone by answering questions at no cost and with no obligation. We aim to make the world of law understandable to all.